Home » Fundraising » A New Website!!! Welcome to our new site! We are so excited to introduce you to it! Take a look around and let us know what you think in the comments below! Thank you so much for visiting. Make sure to head to the Water Walk page to register for the 2nd Annual Toloha Water Walk on march 22, 2014 in Kinston! Water Walk Registration is OPEN! Water Walk Rep Meeting 2015! Key to Sustainability = Training! 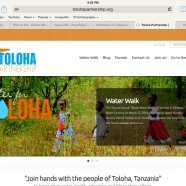 Toloha Partnership is a non-profit organization based in Kinston, North Carolina, USA and Toloha Village, Tanzania, Africa that exists to better the lives of the people of Toloha. We are currently working on a clean water initiative that includes renovating an existing gravity fed water system that is in disrepair. The new water system will provide clean water for over 10,000 people. Once the village has clean water, our vision is to continue work in Toloha, which we hope will meet the ministry, medical and educational needs of the village along with other physical needs.